FIRST DAYS: FRESHER'S FLU, LEARNING AGREEMENTS AND SOCIETIES. During those first few days, everything is so strange, so fast... I was a little lost, some people were saying this, some saying that, I didn't know what to do during the week called "Fresher's Week", the week before classes start. After continually being in one place or another, finally the Erasmus Staff gave us a talk in a HUGE lecture theatre which was full of foreign exchange students, not only Erasmus but also ISEP, etc. 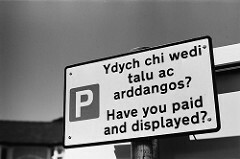 Here I learnt that, among other things, Wales has six consonants and by the way, words like "hello" or "welcome" they say "croeso" in Welsh. In this talk they informed us about what the next couple of days were going to be like, what we would have to do, who we should speak to if we have a problem, etc. There they also spoke to us about the well-known "societies". They are groups of students that all have something in common: fashion, anime, feminism, kayaking, travelling, etc.. . It was quite interesting. At the beginning, my friends motivated me and I signed up to the anime society with them, but afterwards we realised that we didn't like it, or at least I didn't like it enough to stay: they only watched movies, where we weren't allowed to speak and when the movies ended everyone just left without saying anything. To sign up I had to pay £5 to belong to the society for the whole year. Anyway, everything is learned in this life and that's how I realised that I generally and definitely do not like anime. Source: https://i.ytimg.com/vi/QVqnEsvuznE/maxresdefault.jpg This is an image from a movie that we watched when we were in the Anime society, "My Neighbour Totoro". 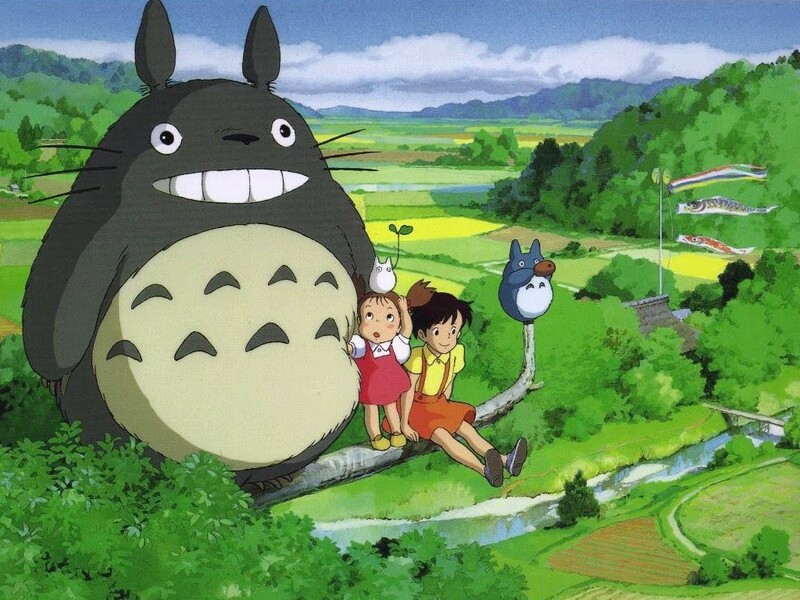 It is a film by Hayao Miyazaki that had great success worldwide. I had never heard of it, but one thing I did like was the colours. Anyway, the subject of societies was something that surprised me for the better, there is a lot of variety to choose from and it's a way to have a first hobby and meet people. Anyway, the best of all was that when I left the talk there was FREE food. The following days were a bit turbulent: preparing the "learning agreement" was a horror. Two days looking, reviewing and changing the subjects I was supposed to take, (that's why I have repeated so many times that it's important to have it AT LEAST half finished before arriving at your destination). Everyone who has been on Erasmus knows that it's a pain, the topic of credits, validations, if I'm all year round, if only a quarter, if I mail the coordinator, here, there... etc.. It's the worst part of Erasmus but luckily, you only have to suffer for a few days, then it ends and you can enjoy it. Anyway, you have two weeks to see if the subjects convince you to continue and if not, you can change them and choose others that are better suited to you or your curriculum. VERY IMPORTANT: Aberystwyth credits are not the ECTS credits we have in Spain, for example, 20 credits in Aberystwyth are 10 ECTS credits. I remember that in those early days I was also warned about what is known as freshers' flu". For the record, when suddenly a significant number of students arrive in Aberystwyth from all over the world, they are all in an assembly hall, in a residence or at the first parties then... The strange thing would be not to catch anything. 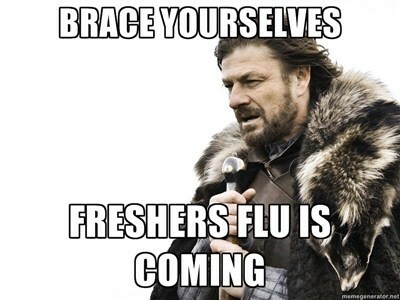 Freshers' flu is characterised by sore throat, head, mucus, fever and sometimes cough. The only solution is to get used to being with foreign people and become immune! Luckily, I didn't suffer from it. I also have to tell you that during the first few days, the Erasmus staff were in charge of organising events so that we all got to know each other. For example, they gathered us all at the Student's Union pizzeria (there was free pizza to attract students), they brought us all together on different round tables and each table was a team that had to solve riddles, or questions about Aberystwyth, about Erasmus, and so on. It was a way to break the ice. The truth is that the Erasmus staff are quite concerned about us being comfortable and give a lot of importance to us and our welfare. Before I left Spain, I never imagined that I was going to receive so much "attention" from them or that there were events like this for Erasmus students to make friends. 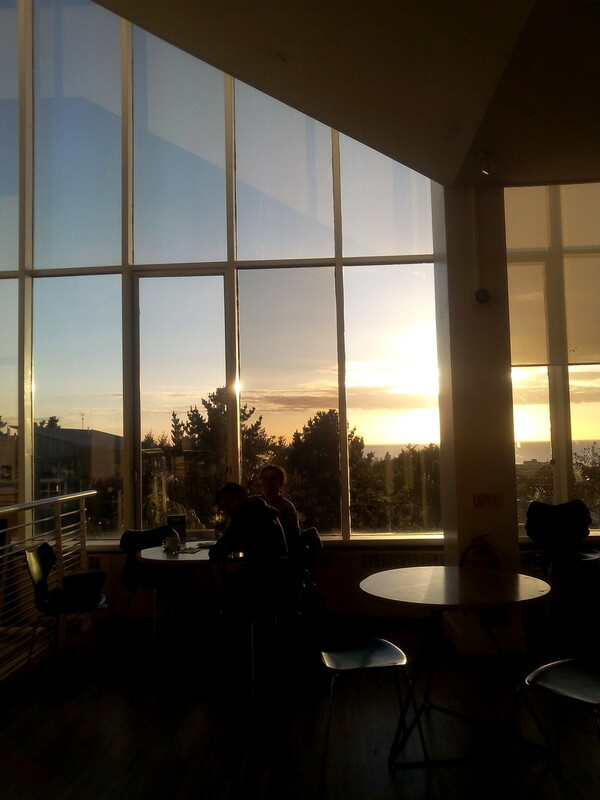 (This picture was taken at Student's Union while we were solving puzzles, quizzes, etc. ). 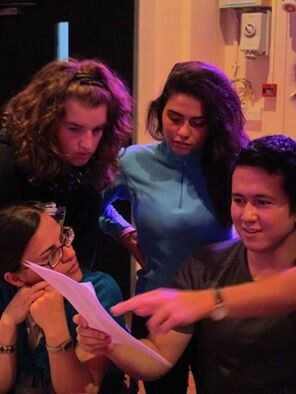 See my face filled with total concentration). In conclusion, that week was exhausting for me. Between missing my bed, the learning agreement, freshers week, making friends, etc, my head was spinning and spinning. I remember those days when I woke up at six in the morning and couldn't go back to sleep. I couldn't get used to it. To top it all off, blinds don't exist in Wales, I think it's a Spanish invention or something (I really don't understand how people can live without blinds). In my room I had curtains that, in the morning, you wake up and that ray of light that enters without a doubt and there is no way to avoid it. And well, when the ray of light doesn't wake you up, the crows (very "Game of Thrones") or the seagulls (they seem to bark) wake you up. At the time, I pulled my hair out without a decent night's sleep, but now when I remember it, I can only smile. I forgot, during the first few days you will get letters to the residence to fill in paperwork. There is one very important bit that you have to fill in if it is the one for the doctor. It doesn't matter if you have a European health card or Erasmus insurance, you have to fill it in for whatever reason. There are some things that you fill in and then you have to take them to the hospital (there are two of them, you need the one higher up) that is up the hill to hell. It is important that you do this, because if you feel ill someday, and you need to go to the doctor you will have to have done all the paperwork and only then can you make an appointment without having to wait DAYS. I hope you liked it, share it if you did! See you in the next post! Español: PRIMEROS DÍAS: FRESHER'S FLU, "LEARNING AGREEMENT" Y SOCIEDADES. Much interested in the statement "Aberystwyth credits are not the ECTS credits" and how it happens in general. I have never thought of Erasmus students program this way.. Seems that it looks differently from the point of view of the student (as a teacher, I just see an opportunity and a perspective of learning and opening new horizons). And the cultural gap is so vivid.. When you visit a foreign country, you do have a lot to know (and to learn beforehand about it). The cultural identity changes within a month or two, when a person is integrated in the society (source - http://yourhomeworkhelp.org/ Culture).